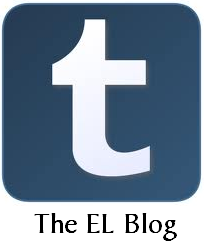 On the surface, this latest incarnation doesn’t look all that different from the first. 24 Swamps? Check. A bunch of Vampires? Check. A dash of aerial support? Yep. Kill spells? Of course. But as we saw with Chandra’s Unquenchable Fire, there’s a shift in positioning that makes the deck quite distinct from what has come before, and indeed in this case it’s even more pronounced. Master of Shadows had a lifegain/life loss subtheme, with lots of cards that played in that space. Blood Seekers drained life when your opponents played creatures, while Pulse Trackers pinged on the attack. A Sanguine Bond helped reinforce the theme, and Ruthless Cullblades were a payoff for burning down your opponent. Blood Hunger goes an entirely different direction. This time, it looks to take advantage of the bloodthirst mechanic which made its triumphant return in Magic 2012. 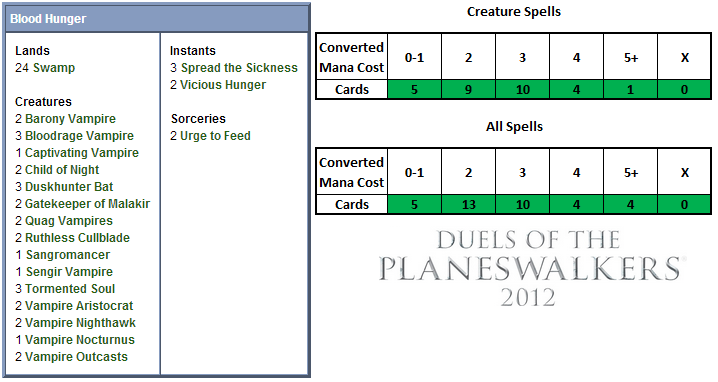 Originally the guild mechanic of the Gruul in Guildpact, Magic 2012 offered a lot more tools to take advantage of it, not least the Tormented Soul. Blood Hunger’s canniness doesn’t end there, however- it also has a “+1/+1 counters matter” subtheme that’s particularly relevant due to the presence of a trio of Spread the Sicknesses in the removal suite. It’s this clever combination of bloodthirst and proliferate that gives the deck its flavour, and highlights how the Duels of the Planeswalkers series can offer preconstructed decks that have a place all their own in the Magic multiverse. Blood Hunger presents an aggressive face, but it’s not quite as fast as it looks. A pair of opening Quag Vampires from Worldwake lead off the deck’s one-drops, but you’ll only ever look to play these for one mana in the direst of situations. Given the deck’s synergy with +1/+1 counters, this is a much more advantageous three-drop. The more you pay above that, the more inefficient it gets, but that’s the design tradeoff of the multikicker mechanic. There’s also the requisite trio of Tormented Souls, which in this build are bloodthirst enablers par excellence. With the ability to nip past an opponent’s defenses each turn, their 1 power won’t pose as much of a threat as the simple fact that they’re actually inflicting damage. Some familiar faces return to usher us into the two-drops with the Ruthless Cullblade and Child of Night. Both of these fill similar roles, one as an aggressive attacker and the other as a lifegain threat. Once you’ve managed to put your opponent down to 10 life, the Cullblade becomes a 4/2 beater- a steal for two mana. A trio of Duskhunter Bats provide the bulk of your air force, being mere 1/1’s that have bloodthirst. Finally, two Gatekeepers of Malakir pick up where Master of Shadows’s Heartstabber Mosquitos left off, being removal attached to a body. Fully kicked, the Gatekeeper costs less than half of what the Mosquito does, but then that’s the difference between targeted removal and an edict effect- not to mention evasion. There’s no shortage of options in the three-drop slot, either. Vampire Aristocrats and Vampire Nighthawks make a return appearance, but there’s some fresh blood as well. The Barony Vampire is a vanilla 3/2 creature, while the Bloodrage Vampire starts out a touch weaker but carries bloodthirst to make up for it. Finally, we find our first rare here in Magic 2011’s Captivating Vampire. This card is a brutal inclusion, both in that it gives you a lord to pump your team +1/+1 across the board as well as a nasty surprise for your opponent. Tap any five Vampires you control, and voila- permanent, instant-speed creature theft. Not only that, but unlike Control Magic and its variants, there’s no enchantment that can be destroyed to free the victim, it is indeed “captivated” in the literal sense of the word. As we move to the four-drops, we are delighted to see the return of Vampire Nocturnus. Not every Duels deck gets a mythic, but this is a wicked inclusion in a Vampire-themed construction. In exchange for a little revealed information (which has some benefit to you as well), you get to grow your army and give them wings. It doesn’t take too many activations of this to wrap up a game, as there aren’t a lot of decks that can withstand a sustained air assault in numbers. We find another rare card here with Mirrodin Besieged’s Sangromancer. In addition to being a 3/3 evasive creature, the Sangromancer has a fairly unusual pair of triggers. First, whenever one of your opponent’s creature dies, she gives you a dose of lifegain. Second, whenever your opponent discard a card, she does the same. In this build, the only time that will ever be relevant is when your opponent has to discard down to seven cards in their end-step, which means you’re probably already pulling ahead and the lifegain will be irrelevant. 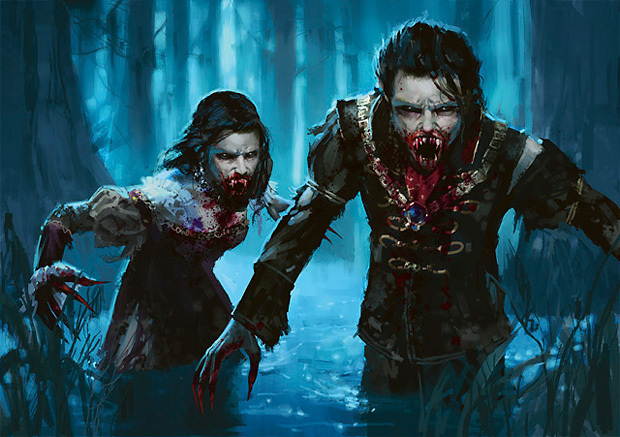 Two Vampire Outcasts from Magic 2012 wrap up the bloodthirst suite, which can grow into lifelinking 4/4’s- no small threat! The deck’s final card is a classic, the five-drop Sengir Vampire. The Vampire is not only your largest naturally-occurring creature (as opposed to ones that grow through bloodlust), but it also can soar past your opponents’ ground-based defenses. The icing on the cake is the possibility of it gaining its own +1/+1 counters, which gain has no small value here. With so many Vampires in the deck, there’s little room left over for fluff in the noncreature supporting suite. That’s not necessarily a bad thing, since the deck is able to have very good consistency with the room it has to work in. Leading off is the aforementioned trio of Spread the Sickness. These destroy a single creature outright, then give you a free proliferate to build up your army. It’s a clever little dose of synergy that speaks well to the deck’s design, and although five mana isn’t cheap, the other removal has the early game covered. Vicious Hunger is a two-mana sorcery that syphons 2 life from a creature to you, which is perfect both for killing off a small, annoying utility creature as well as finishing off a wounded larger one. There’s also a pair of Urges to Feed, which give a creature -3/-3 at instant speed. These can be great at letting one of your smaller blockers kill off a larger attacker and live to tell the tale, and again we see an incidence of the +1/+1 counter synergy overlapping with the Vampire tribal. Overall, this is a well-designed deck that weaves together some synergistic themes. We’ll be looking forward to putting it through its paces, and will return with a final grade. See you then!